More and more stroller brands are recognizing the needs of modern parents to have a travel-friendly stroller that can be stashed in the overhead compartment on an airplane. 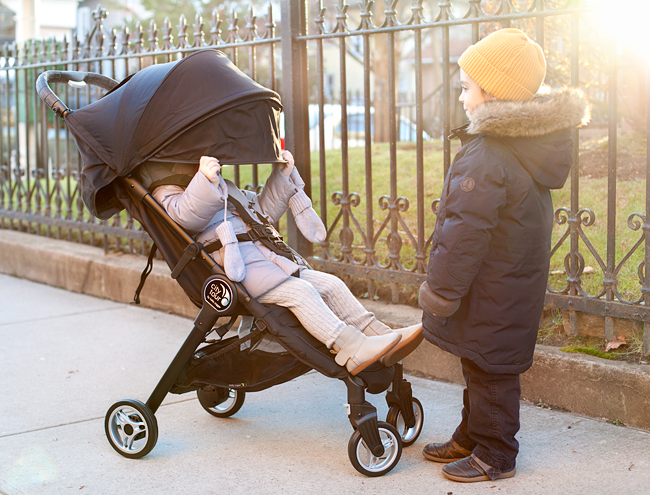 Baby Jogger jumped on board the travel stroller trend in the Fall of 2016 when they released the City Tour stroller. 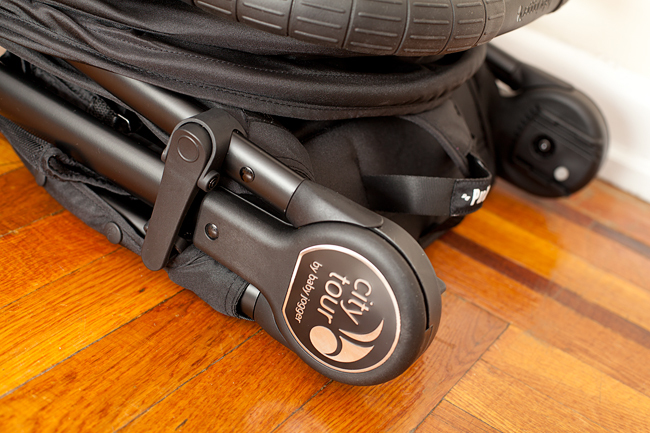 The City Tour is a dainty, yet durable stroller that resembles a scaled down City Mini. 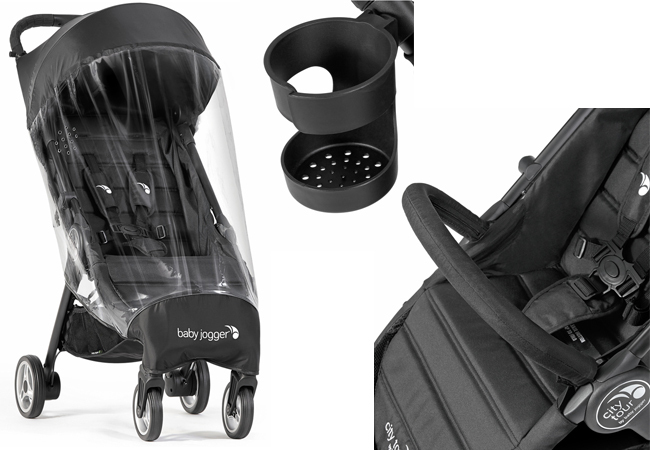 This stroller was added to the Baby Jogger lineup with travel in mind, and so it's lightweight and compact. 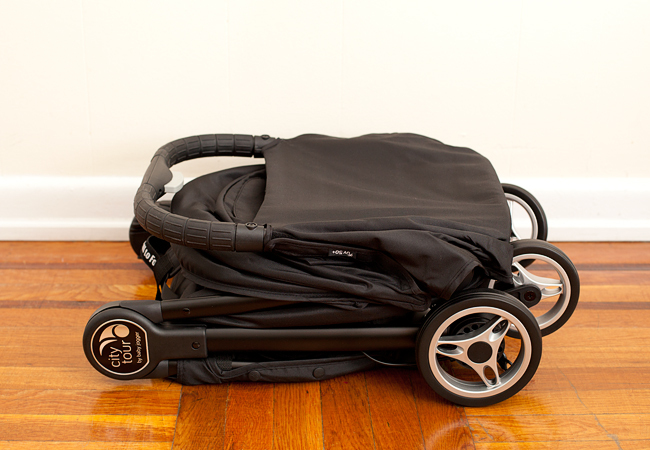 Out of the box, the stroller requires minimum assembly and comes with a travel bag included. If you haven't yet done so, check out my City Tour Unboxing post. This stroller is pretty affordable, especially compared to the competition ( Babyzen YoYo, Mountain Buggy Nano, GB Qbit ). It retails for $199.99 and is available in 5 colors: Onyx, Garnet, Juniper, Violet and Cobalt. With the help of Ben and Abby, we've put the City Tour to the test and I'm here to tell you all about it. Seat back height - 17.5"
Seat edge to footwell - 9"
Footwell depth in center - 2.75"
The seat on the City Tour is not the roomiest that I've seen. Two year old, Abby has plenty of room in the width, but not enough in the seat back length. Already, her head is above the seat edge. There is still plenty of room under the canopy however. The seat is also rather shallow. The footwell is also shallow and doesn't really support Little Missy's feet. Probably a younger child would be much more comfortable in the seat, but it seems that 2 year old Little Missy has outgrown this stroller. The seat has an infinite strap recline and while it doesn't recline all the way to a flat position, it's deep enough for a child to nap. 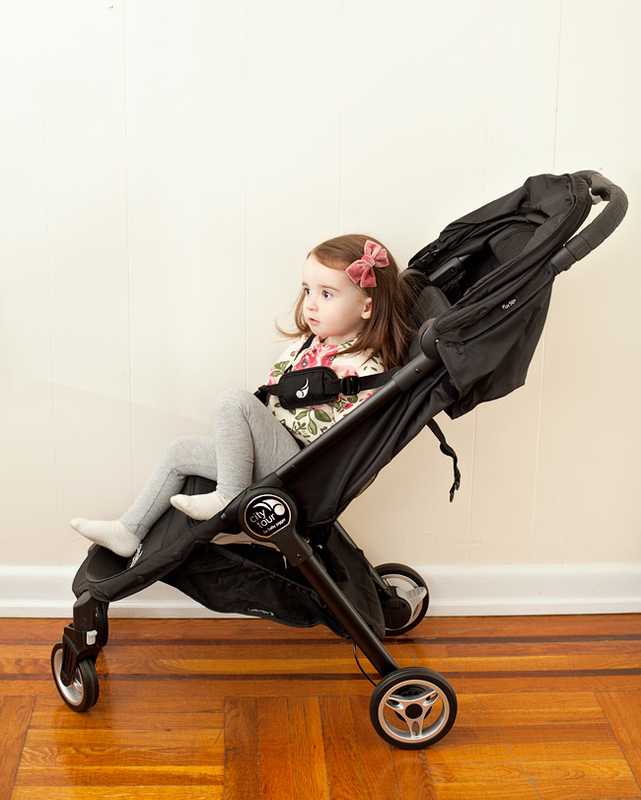 Because the stroller only has a partial recline, it's only suitable for babies 6 month+. Unfortunately, this stroller cannot be used as a travel system with a car seat. 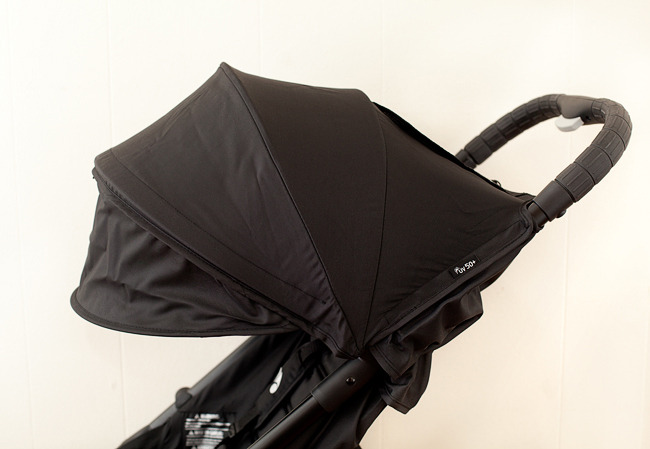 For a compact, affordable stroller, the canopy on the City Tour is very generous. It has three panes and a flip out sun visor. 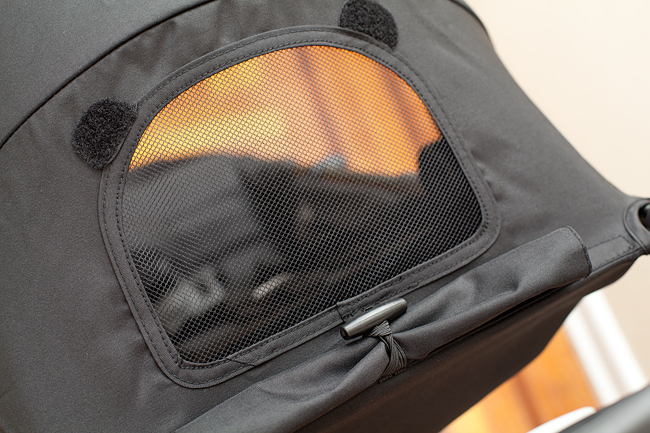 The mesh peek-a-boo window allows you to check up on your baby. The canopy is rated UV 50+. While the seat fabric is hard wearing and easy to clean, I'm not a fan of it's nylony feel and lack of breathability. This is the kind of squeaky fabric that makes kids sweat in the Summer. It's also slippery and actually makes Little Missy slide down in the seat. When sitting in the stroller, she puts one leg up on the seat to prevent herself from sliding. This is unfortunate, because, as much as I like all other features on this stroller, the child's comfort in the seat is of the utmost importance. Perhaps if I had the bumper bar accessory, and didn't buckle the upper harness, Little Missy would be able to keep herself more upright and lean forward in the stroller. 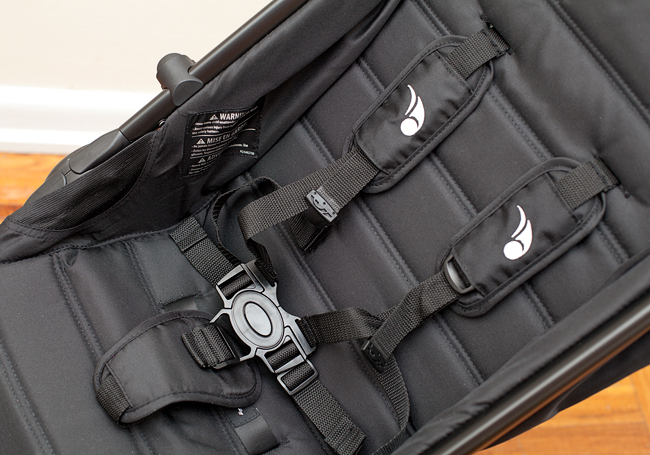 City Tour has a breakaway harness, which can be used as a 5 point or 3 point, leaving out the shoulder straps. It's not the easiest or hardest to adjust, but rather average. The harness pads are not attached and constantly slide down. Despite the small wheels, City Tour is a pleasure to push. 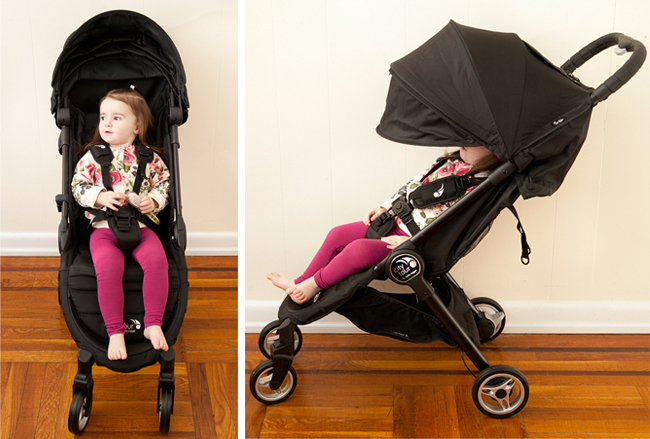 The stroller is agile and easy to maneuver with one hand. The front wheel suspension absorbs small bumps in the pavement. Obviously, this stroller was intended for urban use, so don't expect miracles. It does perfectly well on pavement and can handle a bit of short grass. 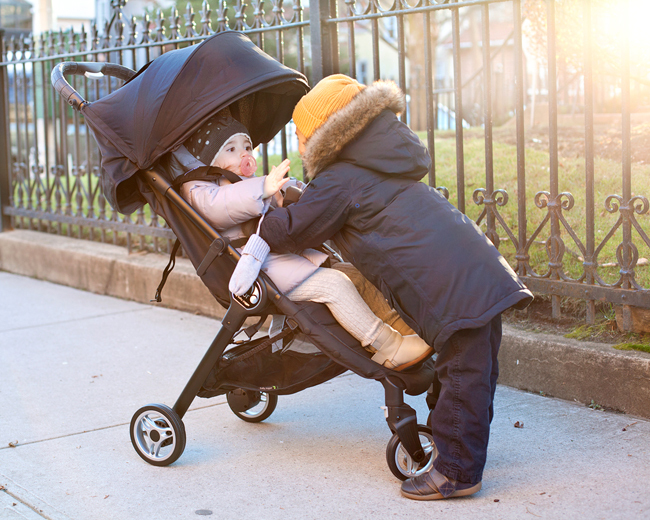 The stroller has a great curb pop, but it comes at a price. 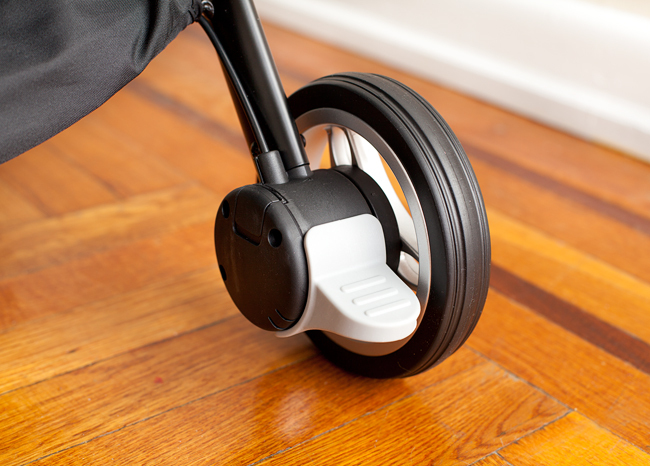 Pressing down on the handlebar will effortlessly raise the front wheels, but this also makes the stroller prone to tipping if weight distribution is shifted towards the back. There's even a warning printed on the back of the canopy, stating that nothing should be suspended off the handlebar. You know what that means. 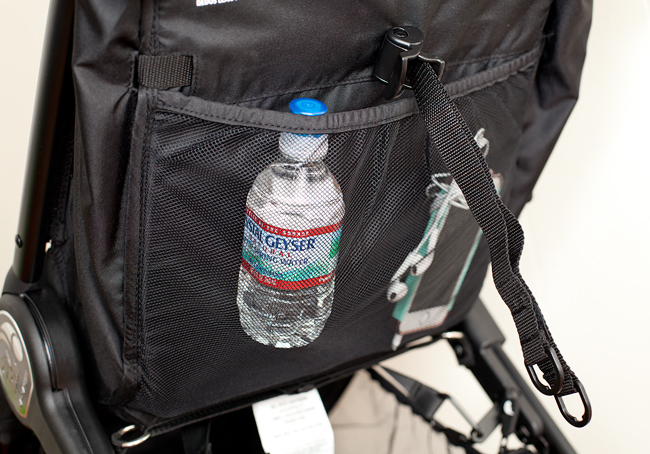 You can forget about hanging your stuffed diaper bag on the handlebar. The handlebar is 38" from the ground, a comfortable height of average parents. 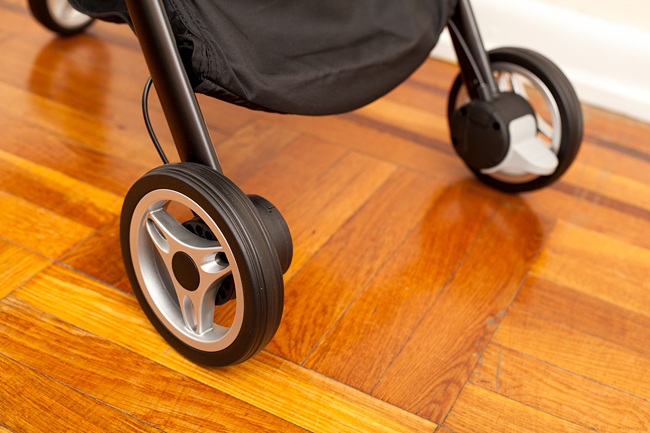 It is covered in rubber with a grip texture, like all other Baby Jogger strollers. In the center of the handlebar is a pretty prominent fold button. The handlebar is not adjustable, which is not surprising on a compact stroller in this price range. City Tour rolls along on four EVA wheels, 5" in the front and 6" in the rear. 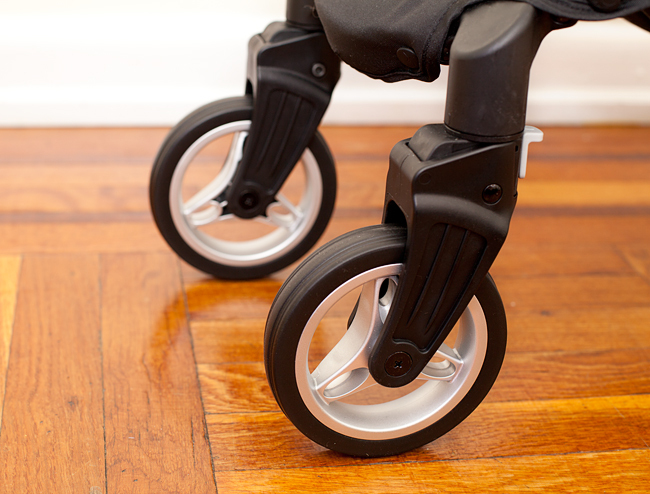 The stroller is equipped with front wheel suspension. The front wheels can also be locked from swiveling, to help with a bit of uneven terrain like grass. The small pedal break is located at the right wheel. It makes a loud, reassuring click when engaged. There is a mesh pocket in the back of the seat, convenient for storing small essential that you'd like to keep close at hand. The under-seat basket is not very roomy, but that's understandable, considering the size of the stroller. In the picture, I have my shoulder bag in the basket and it pretty much occupies most of the room. You will not be able to fit a diaper bag into this basket. On positive side, the basket has a nifty zipper compartment, so you can keep some items separate. I actually wish every stroller basket came with a pocket like this! In order to qualify for carry-on luggage size, the City Tour has a tri-fold. The fold requires two steps, but can be done with one hand. 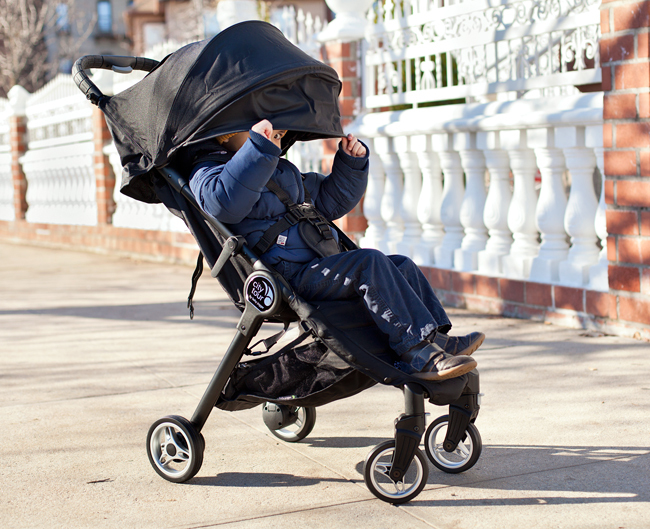 First, you need to press the button located on the handlebar and collapse forward the upper portion of the stroller. 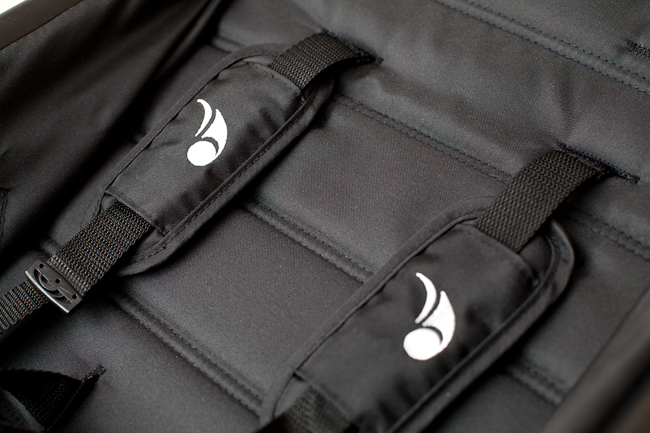 Then, you grab the fold strap located on the seat and pull up. This collapses the lower portion of the stroller. The stroller has an auto fold lock. 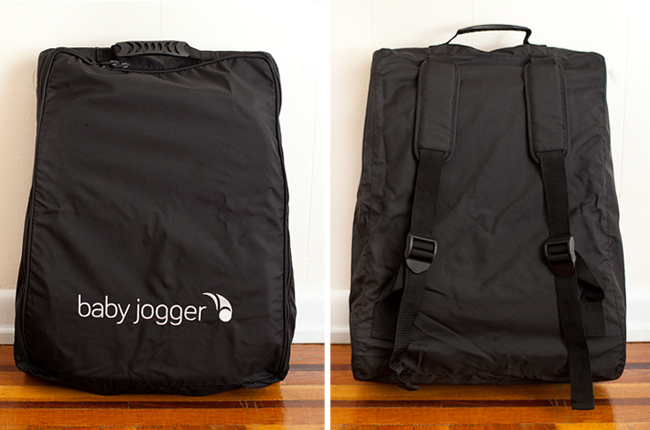 Included with the City Tour is a knapsack-like carrying case to stash your folded stroller in when traveling. If for whatever reason you decide to carry the stroller without the carrying case, this will be rather awkward, since only the lower portion of the stroller is held closed by the fold lock. 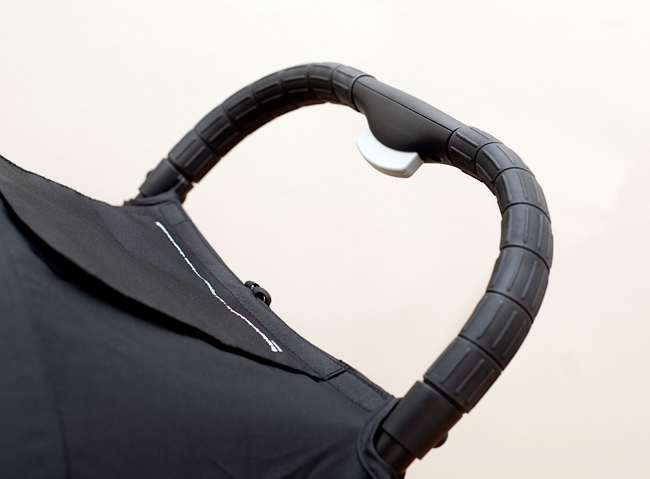 If you tried picking up the folded stroller by the handlebar, the upper portion will unfold. A bit of an oversight, in my opinion. As much as I like having a carrying case, not every situation calls for one. The trick to preventing the City Tour from unfolding when picking it up without a carrying case, is to grab the handlebar and the quick-fold strap simultaneously. Aquard, but doable. 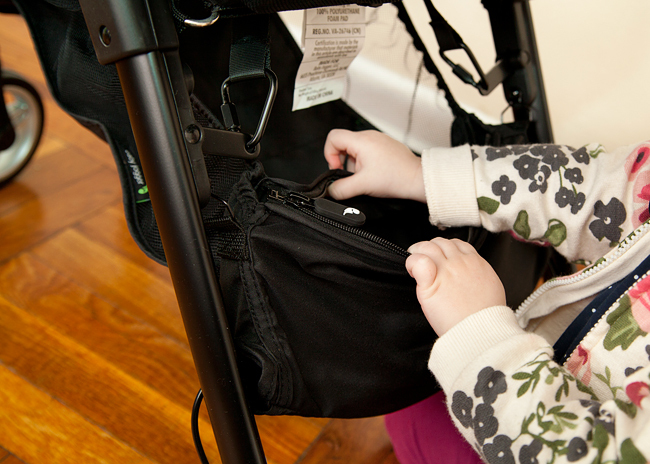 While a carrying case is included with the stroller, other accessories are sold separately. 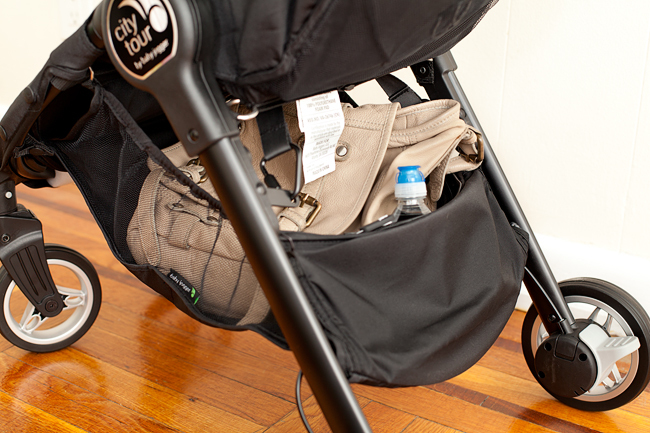 You can add a bumper bar, which is always great to have on any stroller, a rain cover and a parent cup holder. While I really like the concept of this stroller, I would not use it for every day (unless maybe to run a short errand), due to a small seat and lack of storage. I think it's primary strength is in the compact, travel-friendly fold. The City Tour is more affordable than other similar options and so it would be a serious contender specifically for travel purposes. Sadly, lack of car seat compatibility and a seat that can only be used from 6 months, narrows the potential customer base for this stroller. Since Baby Jogger has many other strollers in their lineup, they wanted it to be very clear exactly what this stroller was intended for. Weighting out the City Tour's pros and cons and based on our experience with this stroller, I've decided to give it a 3.5 out of 5 star rating. The stroller would be much improved if it was made to be suitable from birth and with a roomier seat. 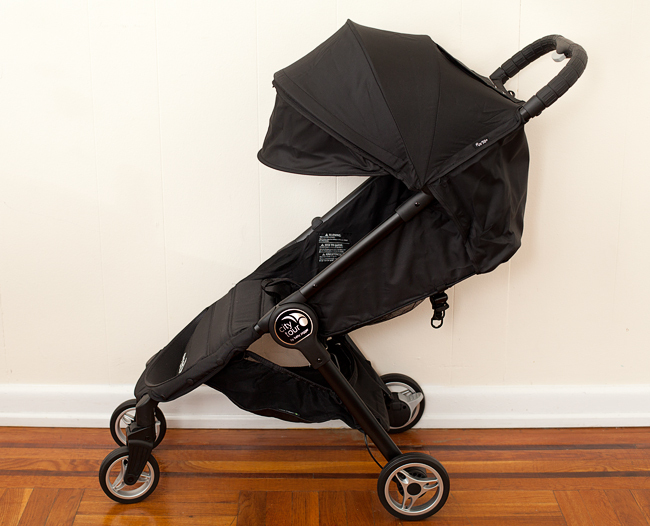 I'd like to thank Baby's Den for providing a stroller for this review! As always, all the opinions are entirely my own. 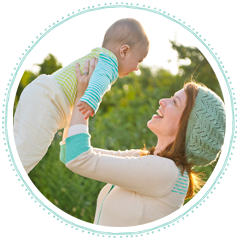 Baby's Den is currently running a 10% Off promotion on full priced merchandise, plus free shipping and no tax. Use code HOLIDAYS at checkout.